for Commissioner Sam Adams at lunch today. From the opening speech that was given by a former Portland City Commissioner (Earl Blumenauer) to the last event of the day which was headlined by a Portland-based lawyer (Bob Mionske) and just about everything in between, Portland was all over the National Bike Summit today. Today’s informational “breakout” sessions were also full of panels featuring Portland bike stars. Among them was bike lawyer Bob Mionske. Mionske, who you might recall made headlines back in November for his claims of bias against cyclists in the Portland Police Bureau, was a panelist in a session titled, Promoting Cyclists’ Rights, Responsibilities, and Protection Under the Law. He was also the featured speaker at the League’s annual meeting which took place tonight. Scott Bricker shared his insights into Portland’s bicycle boulevards. 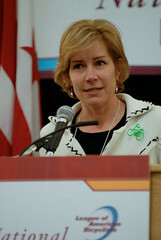 Veronica Rinard told the crowd about Travel Portland’s work to use bikes as a tourism draw. 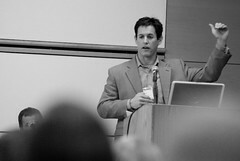 In a later session, Dan Bower from the City of Portland’s Transportation Options division tag-teamed with Scott Bricker from the Bicycle Transportation Alliance (BTA) to share the Portland story in a session titled, Getting More People Riding: The Two Mile Challenge. That session was likely the most popular of the day, with an over-capacity crowd eager for more insights into what makes Portland tick (and to learn more about Clif Bar’s awesome 2-Mile Challenge campaign). Just down the hall from that session, former BTA staffer and North Portland resident Robert Ping was on a panel discussing the national Safe Routes to Schools program. The Keynote Luncheon was next, and even though City of Portland Commissioner Sam Adams didn’t show for his scheduled keynote speech (he’s sick with the flu), five capable Portlanders stepped up to fill his shoes. Jerry Norquist from Cycle Oregon, Jay Graves of the Bike Gallery, Veronica Rinard of Travel Portland, Roger Geller of PDOT, and Scott Bricker from the BTA each spent a few minutes telling a different part of the Portland story — from financing strategies to tourism — to the 500+ in attendance. And the Portland show didn’t stop there. In the afternoon sessions, City of Portland bicycle coordinator Roger Geller was on a panel for a session titled, Rethinking Transportation — The Role of Bicycling in Great American Cities. So, whether we’re comfortable on stage or not, our bike-friendly accomplishments have made us the model that cities across the country are looking to for guidance, innovation, and a bold performance on behalf of bicycling. I hope we continue to meet and exceed these expecations. After all, the show must go on.